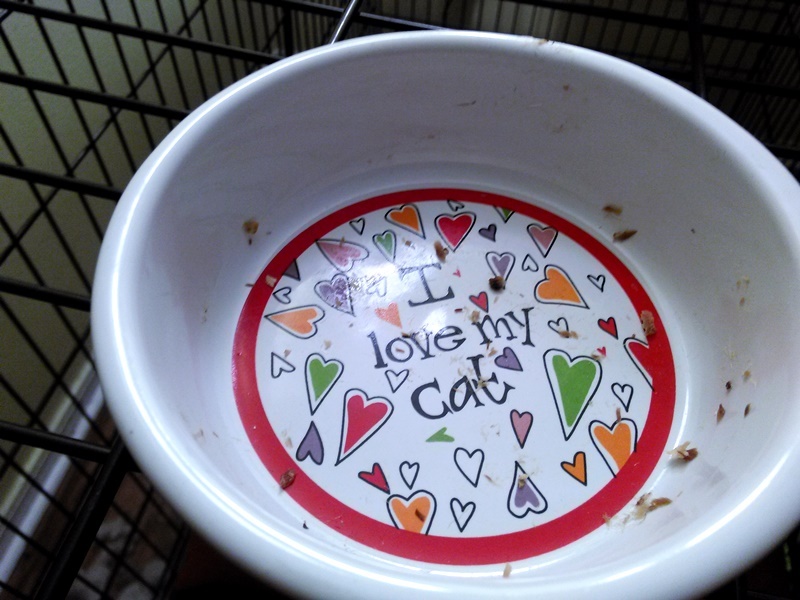 It’s no secret we love our pets. Our cats were our first pets and that makes them have a special place in my heart. 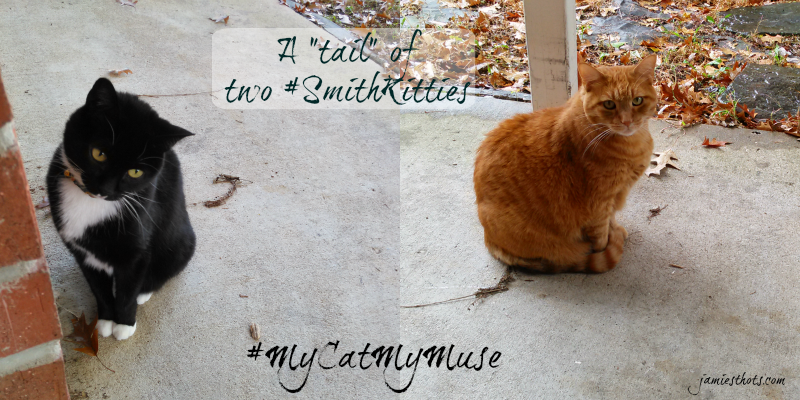 Yes, the #SmithKitties even have their own social media hashtag. I would say that our cats continuously teach me how to love how someone needs to be loved. Both John and I think it’s important to take care of our pets both for their healthy and safety, and our sanity. After all, a happy cat is a less destructive cat! We make sure they have the right kind of nutrition such as Purina Muse® Natural Cat Food and we make sure to provide the play stimulation they need. That’s pretty much where the similarity ends! As you can see, our cats are completely different. The tuxedo cat is named Missy and she’s about 9 pounds and 8 years old. Colby is about 17 pounds and he is an orange tabby who is 7 years old. I grew up in a family who didn’t have cats so my only exposure was cats of friends and relatives. I thought cats were either mean and standoffish, or super cuddly. It never occurred to me that cats could have personalities beyond that. Missy, for example, is attentive but she’s not cuddly. When we first rescued her, I thought since she wasn’t mean that meant she was cuddly. She hated being picked up and still does. Instead, she likes to be allowed to just sit right near us and observe. She’s especially attached to us when we’re sick. She just senses it and she keeps watch over us when she knows we don’t feel well. Missy only shows affection when it’s on her terms. That took me a long time to get used to and I still struggle to understand her at times. 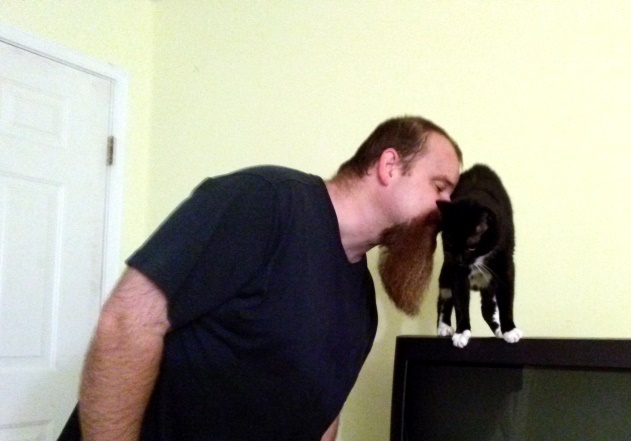 Missy demands that John lean in so she can rub against his face when he gets home from work. She’s an attentive cat but affection like I know it is usually a no-no and always must be on her terms. Colby is the complete opposite. He is almost bossy about being held and cuddled. He even lays on my shoulder, which was adorable when he was a three-pound kitten but not so much now that he’s the size of a small dog. He loves to be held like a baby and especially enjoys cuddling with John while we watch television. Colby has not been feeling great lately because of all the weather changes. That why he looks less than pleased at me taking this photo. He is an almost demanding lovebug. 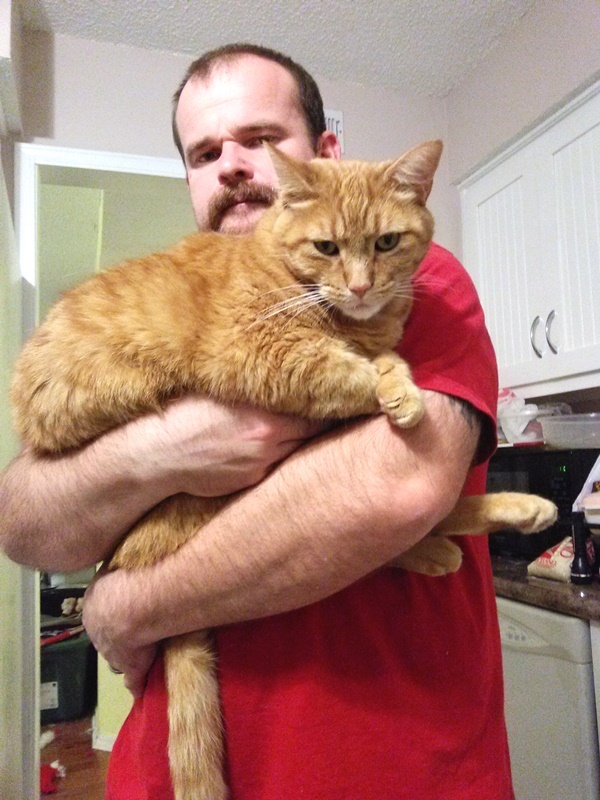 Yes, he’s a huge cat. We used to have all sorts of toys for the cats but truth be told, I don’t recall them ever playing with them much. Once we got dogs, we had to take up most the toys because the dogs loved chewing on them. 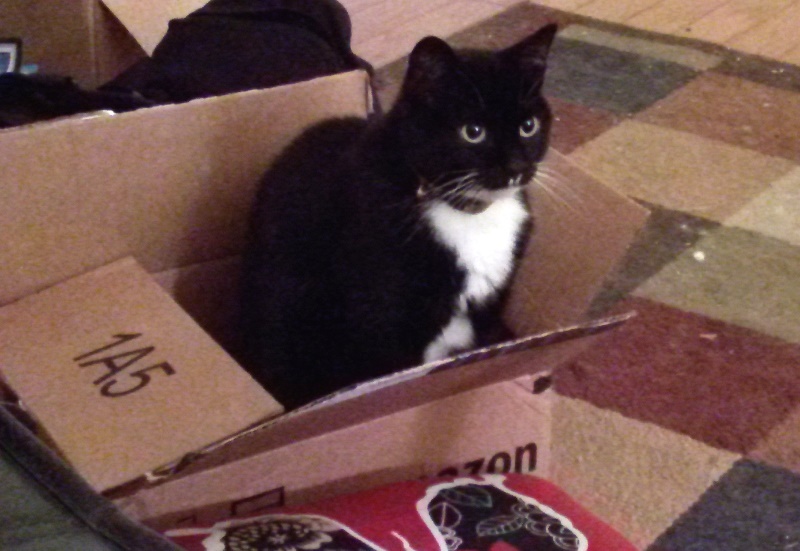 Like most cats, ours seem fascinated with whatever box they can find. Colby can find comfort in the most odd places and positions. He likes to sit on boxes more than in them. 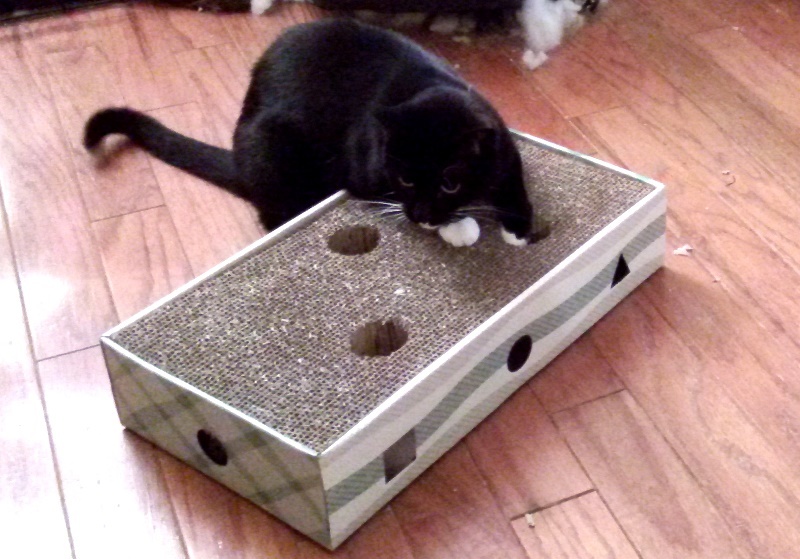 They also both love scratchers but prefer different styles. 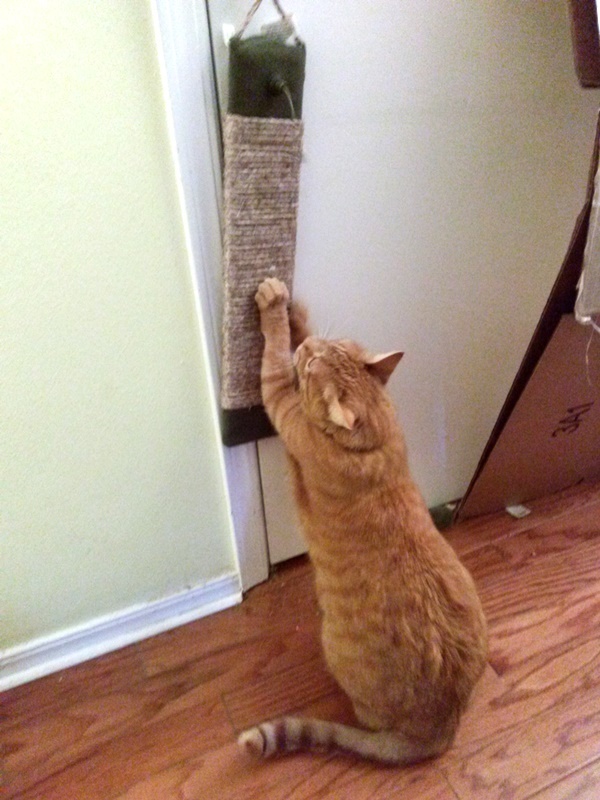 I consider scratchers to be part toy because it provides stimulation, part healthcare because it helps trim their claws, and part house protection because the scratchers help prevent the cats from scratching our stuff! Colby prefers the kind that hangs from the door handle. Missy likes the corrugated cardboard style. We recently found one that not only has the corrugated cardboard but it has a catnip-coated ball underneath that cats can use to play. 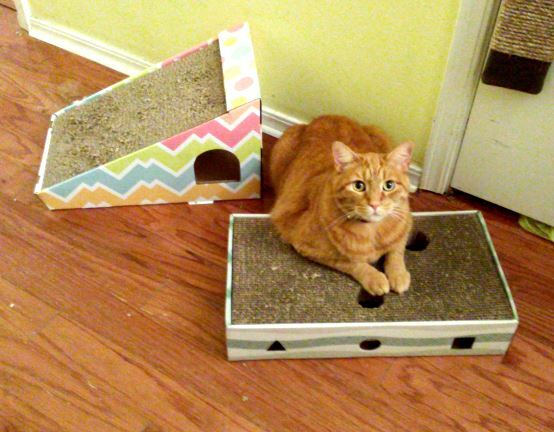 This was the night she figured out there was a smelly and loud ball underneath her scratcher. It only took her a few minutes to learn how to completely remove it. 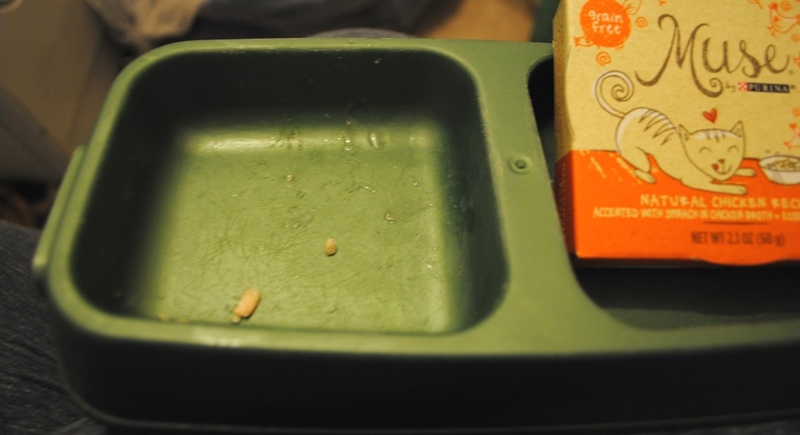 Our cats also have incredibly different dietary needs and likes. Colby is the most fussy and won’t eat any seafood unless we sneak it in with his favorite flavors. He seems to prefer pate. We have to feed the cats up high so the dogs won’t get into their food. We used to feed them both on the washer and dryer but Mr. Colby kept getting into his sister’s food. Why are you interrupting me while I’m eating? Missy will eat poultry but she goes crazy over seafood, especially the “specialty” fish mixtures. She recently stopped eating and we figured out it was because she was tired of the food she was getting. Unlike a human kid, she can’t just tell us that. We have tried all kinds of flavors, brands and styles. We’ve learned what styles make her throw up and what makes her turn up her nose. We’ve also found what she loves. She tends to love the small cans of blended fish. She is allergic to corn so we never allow that in her food and prefer grain-free for both cats. Because of the aforementioned problem with Colby getting into Missy’s food, we moved Missy’s eating place to on top of the dog crate. If the dogs harass her while she eats she lets them know that isn’t a good idea! One food we tried them both on recently Purina Muse® Natural Cat Food. We were drawn to the fact that it has natural products and has 24 grain-free varieties. With Muse you don’t have to choose between natural nutrition and food that tastes great. 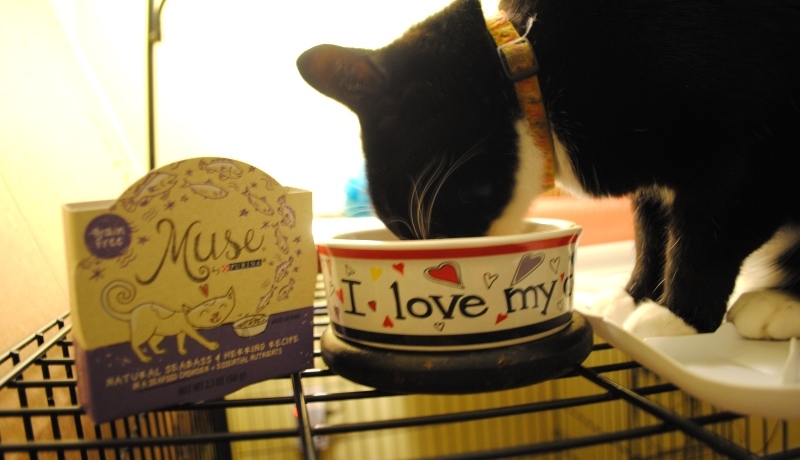 Your cat can have both when you choose Muse. 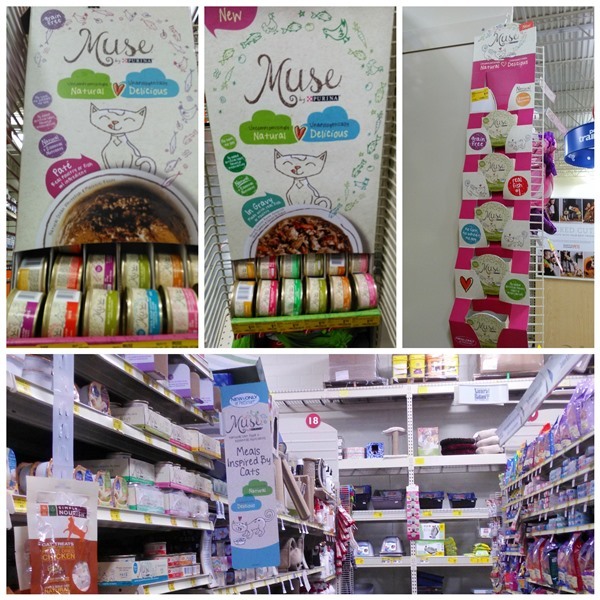 Right now you can find Muse at PetSmart. I found it in several places in the specialty cat food aisle area but the easiest displays were the endcaps that were separated by type. 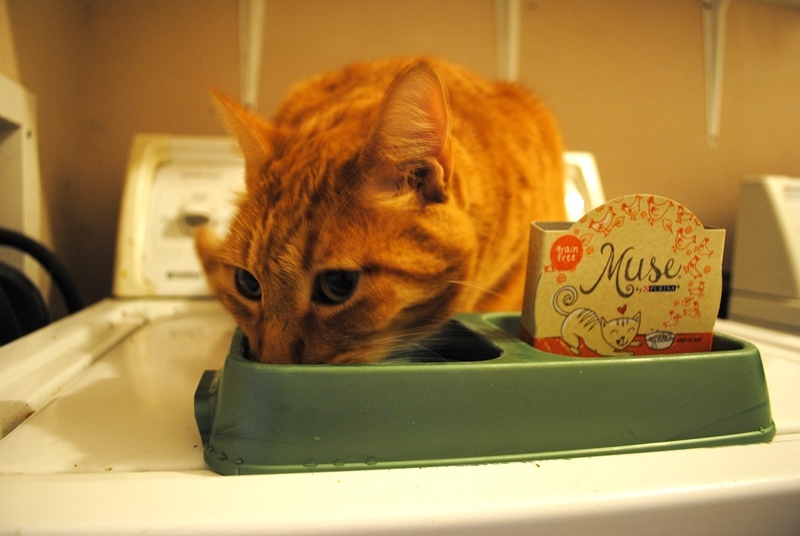 Muse has wet recipes available in Chowder, Broth, with Toppers, in Gravy and Pate. Try it with your cats using this coupon. Colby’s dish after a few minutes. Missy’s dish after about 10 minutes. 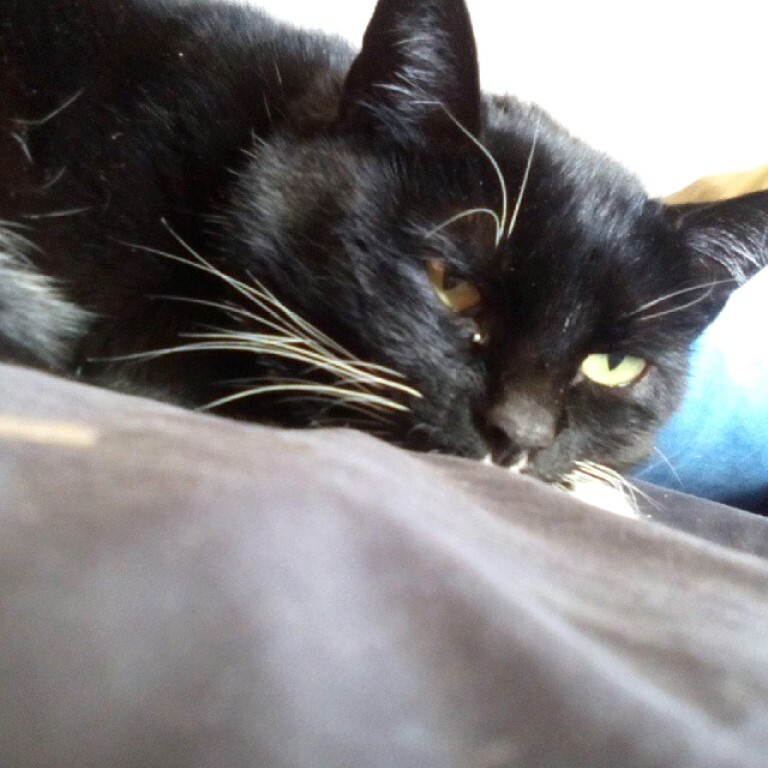 After a good meal or play time, any cat (or human) would love a nap. Our cats even have different preferences when it comes to sleeping areas. When Colby was a kitten, Missy took on the momma cat role and they often slept together. That just won’t work anymore. 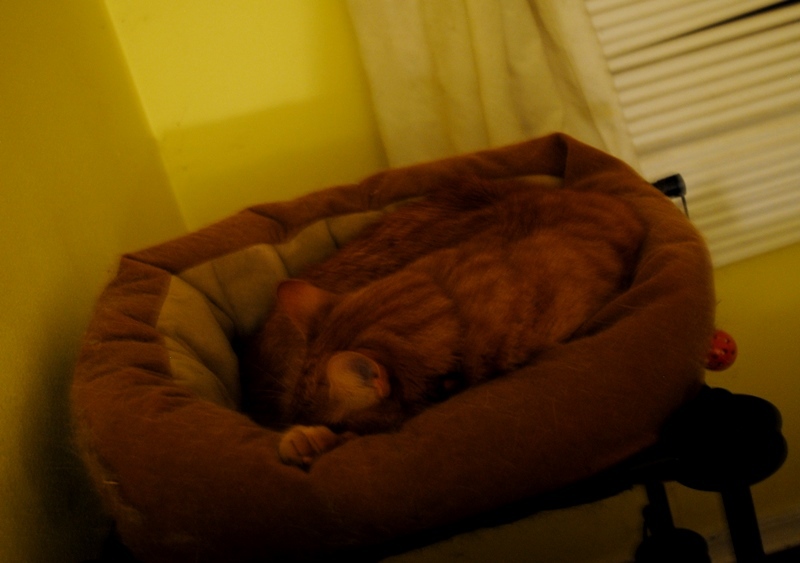 Colby likes to fit in one of our cat beds and of course it’s one that is really too small for him. Don’t turn on more lights or it will wake up the cat! For the longest time, Missy slept on top of our 15-year old (read: huge) TV. She now prefers the end of my bed or pillows right next to me on the couch (remember what I said about her supervising?). She woke up from me taking this picture. I’m not sorry because it shows off her gorgeous eyes. Do you have more than one cat? Or perhaps two of another species? What have you learned about meeting varying needs from that experience?